By Chris Williams: Trainer Freddie Roach doesn’t have clue one about who his fighter WBO welterweight champion Manny Pacquiao will be fighting next other than biggest fight he can get. Roach, who usually has a pretty good idea who Pacquiao is interested in fighting, doesn’t know in this case who Pacquiao will be fighting next. Pacquiao looked bad in winning a questionable decision over Juan Manuel Marquez on November 12th in a fight that most boxing fans saw Marquez winning. 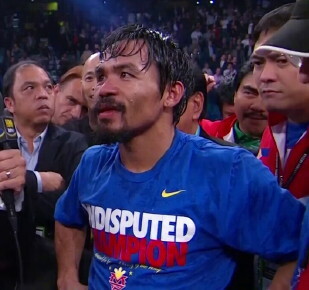 I had Marquez winning by a couple of rounds even after I gave Pacquiao a coupe of rounds where I saw Marquez winning. I think it comes down to Bob Arum who Pacquiao fights next, and he’s already tipped his hand by saying that he’s interested in seeing a fourth fight between Pacquiao and Marquez. It’s a choice that really is a no brainer. If you put Pacquiao in with Mayweather, Pacquiao is going to get humiliated and beaten by a lopsided decision. The Marquez fight won’t be nearly as big as it is now after Pacquiao gets schooled by Mayweather. Although Pacquiao will likely get beat again by Marquez in a rematch, the fight will be close enough to where the judges will probably give it to Pacquiao again. Marquez will probably be the better fighter in the minds of boxing fans, but Pacquiao will probably get the decision again, I hate to say. He’s a really popular fighter right now and that counts for a lot. But in a fight against Mayweather, Pacquiao will get whipped so badly that the judges won’t be able to score it for him because it’ll be academic who’s won the fight. When you see Pacquiao getting beaten black and blue by Maweather, there’s no way a judge on the planet will give him the decision. This is why I see Pacquiao facing Marquez next, and winning another controversial decision that the boxing world completely disagrees with. Pacquiao kind of reminds me of Julio Cesar Chavez Sr. when the wheels started coming off his game late in his career. He got a draw against Pernell Whitaker and a technical decision win against Frankie Randall in fights that many boxing fans thought Chavez should have lost.